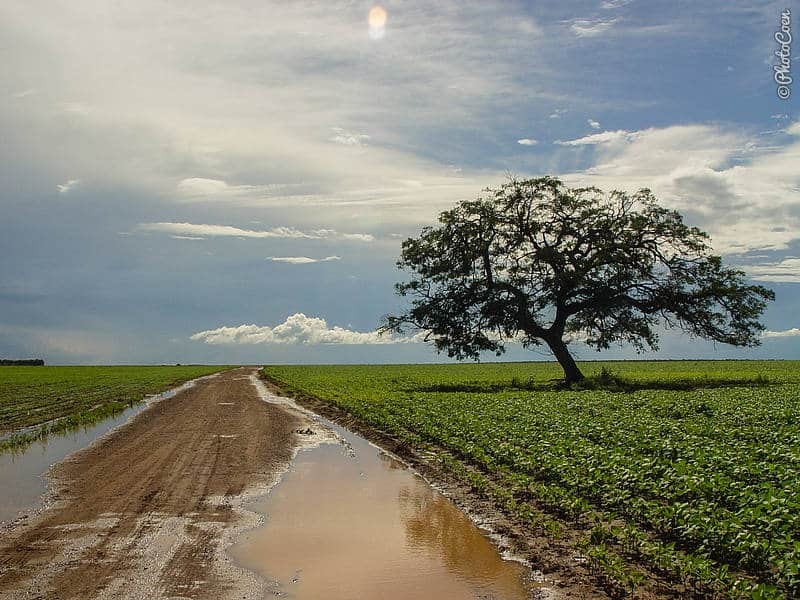 This is part 1 of a 2-series story about our off-road journey through the interior of Northeast Brazil. Here you can find part 1. The Land Cruiser stood among caterpillars and a clutter of rusted metal, spare parts, half-rotted cars, empty oil bottles, and rubbish that is typical of any roadside garage in South America. It was our camping spot. The day before, the spare tank with sixty liters of diesel had broken off on a tough, potholed track. It had taken us hours to get the thing into place again and to secure it in an improvised manner with a towrope. We had driven to the nearest town of Alta Parnaíba at a snail’s pace. The rocking motion of the fully filled tank had caused the construction to break off at three points. All afternoon Jonas, the mechanic, and Coen toiled to get the tank welded in place again and to reattach it to the protective hood. Jonas reinforced the protection hood with a much higher quality of steel than the original construction made in Bolivia a few months earlier. Jonas, the robust, open-faced owner of the workshop, came from Paraguay. We invited him for a beer at the bar of his neighbor, where the barman offered us a selection of his homemade cachaça with medicinal herbs. In Jonas’ hometown in Paraguay there had been twenty-four workshops. It had been hard to make ends meet. In this area there were only four. He made good money but life was expensive as well, he said. Most goods, among which spare parts, were brought to these hinterlands by boat. However, the port was 230 kilometers away. For each package, even if it was just a bottle of beer, Jonas paid 20 reais to have it delivered by bus here, in Alta Parnaíba. 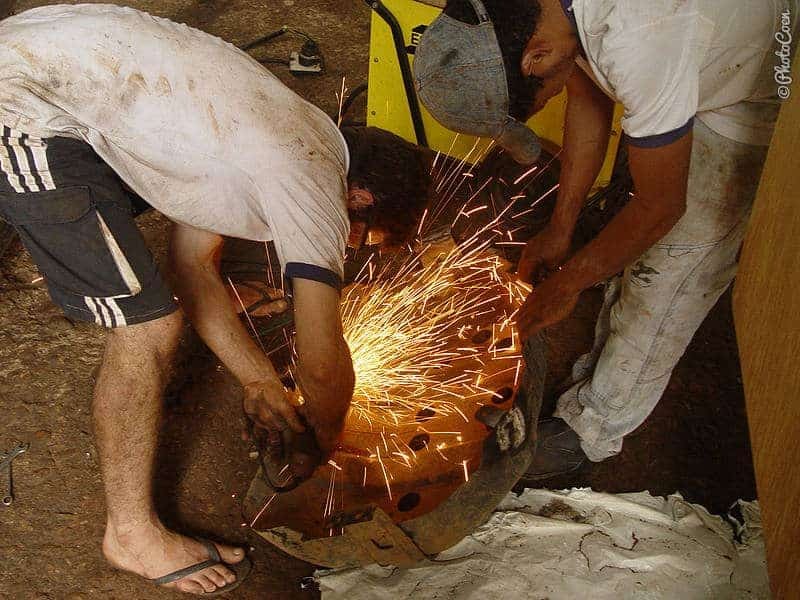 We paid him 80 reais (35 euros) for the welding job. It wasn’t cheap but Coen was confident that the job had been well done. We would need that for the trip to come. 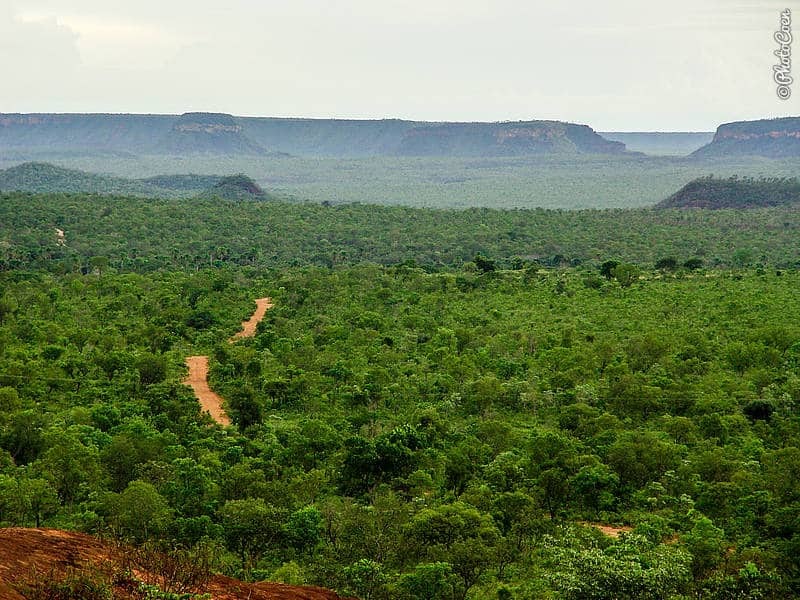 Each year the Sertão Rally crossed this region. We could see why. Smooth tracks suited for speeding alternated with winding, non-maintained stretches where a good deal of forethought was needed. Laterite with washboard suddenly turned into thick, slimy mud and soon Coen felt the strain on his shoulders from the intensive steering. For a long time we didn’t come across any other road user. We were surrounded by green. Soya, 360 degrees around us, stretched away towards the horizon. The fields were interspersed with clusters of trees that betrayed the locations of fazendas; the trees provided the houses with shade and protected them from heavy wind. I put towels underneath the windscreen, around the clutches and inside the glove compartment. The first drops were hitting the roof and the Land Cruiser had leakage problems. The sky was turning dark grey with some patches of granite. The agricultural fields stopped. 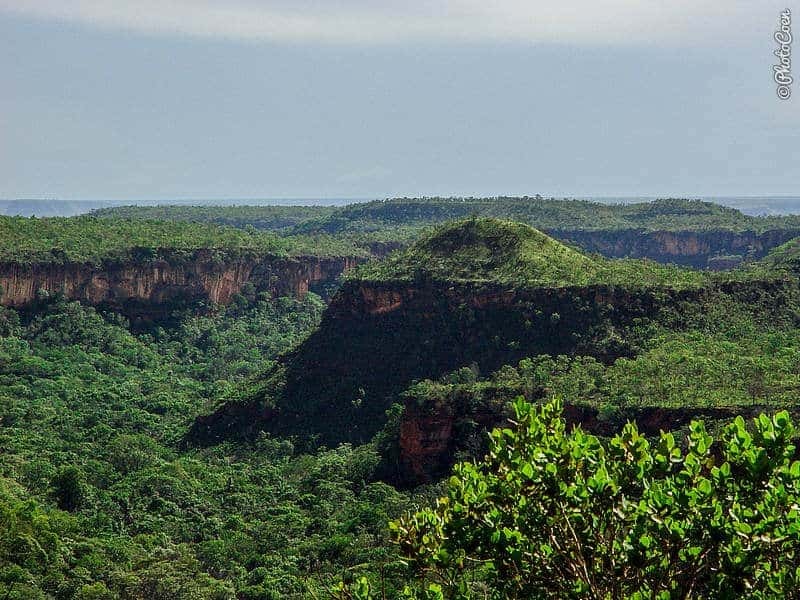 We were back in the cerrado with cashew trees and veradas: clusters of buriti palm trees that indicate a stream or waterhole. We had to watch out for rickety, slippery wooden bridges that most likely were located right behind a curve. Along the side of the road walked a woman dressed in white. I assumed she enjoyed doing the laundry. Who wears sparkling white clothes in the middle of nowhere? It is a forbidden color in our ‘wardrobe’. Her one-year-old son wore only diapers. With Mama holding his left hand he had the other free to hold up his trophy: the bottom half of a plastic bottle. A wooden cart pulled by two thick, white oxen came our way. It is a common means of transportation in these rural areas and the passengers waved as we passed one another. A heavenly shower opened, again. The windscreen wipers arced at their fastest setting as the steep path transformed into a river. Ochre-yellow water rushed down, creating whirlpools that hid treacherous potholes. We no longer could see the road surface and the Land Cruiser crawled at its slowest speed to prevent damage. Every once in a while a tire disappeared deep into a hole and we held our breath. Coen navigated the path with all due care and attention, and the strain was visible on his face. 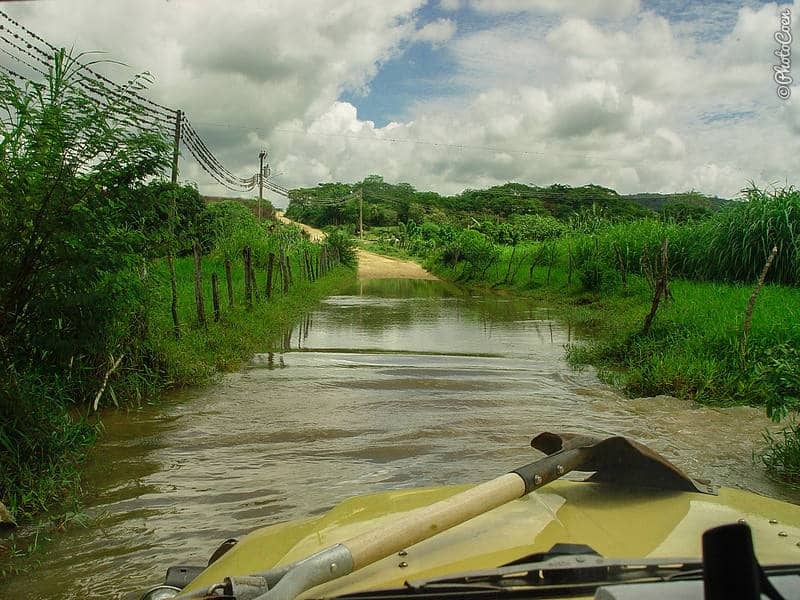 We were learning what it was like to drive in the Amazon during the rainy season! Fortunately, the Land Cruiser is built for these kinds of challenges. We had no broken axles as often happened with the local Ford 250. The latter had been converted into passenger buses but were not up to the tough off-roads. Jonas told us they often come to his workplace to get yet another axle fixed. The rain let up for a moment. We stopped on a flat spot. Coffee, and time to take a deep breath and inhale the fresh air before the heat would turn all this water into a sauna again. The wild river had dwindled to a babbling ochre-yellow brook along the side of the road. The silence was interrupted by the monotonous buzzing of insects and the chirping of small birds. A moment of peace in a beautiful spot. We were off again and passed a typical in-the-middle-of-nowhere-bar at a Y-crossing. On wooden planks stood a few cachaça bottles. A billiard table under the lean-to was waiting for players. The bare-chested owner was sweeping his yard with a stiff twig broom, and since there were no customers he had all the time in the world for a chat. He had lived here all his life, having been born a couple of meters down the road. With the sale of his liquor he had money to buy meat in case no cow was slaughtered in the neighborhood. All his other needs came from the land: cassava, potatoes, tomatoes and the onions. Twice a week a bus plied between Palmas and Alta Parnaíba but he hardly ever used it. “Life is good here,” he said, leaning on his broomstick. At noon we had driven 3,5 hours, covering 80 kilometers. We arrived in Morrinho, which means ‘Small hill’. The hamlet with five houses had a public ‘Oi’ telephone that worked thanks to a huge satellite dish. Lanches – snacks – was painted on a turquoise wall with thick black letters. In the door stood a classical sweet grandma from children’s books. Her home was sparsely furnished, with one roughly hewn table and two chairs for guests. In a corner lay four watermelons, lighted by a sunbeam that fell exactly through the open door. We were served a plate of rice and a bowl with a bit of frango caipira, free-range chicken, and potatoes in a watery sauce. We tucked in. A black chicken darted into the room to see where its future lay. It wouldn’t grow fat on what it found inside; the house, including the floor, was spotless. Old jam jars served as coffee cups. We returned to the wilderness. Without realizing it, the right side of the Land Cruiser hit an elevation while the left slid down into an eroded rut. The slant was terrifying. Over the years I had learned not to scream, as it distracts Coen to a point where it doesn’t help a precarious situation – on the contrary. Generally I pinch my nose or stop breathing. This time I did both. The slant became steeper and my fear ratcheted up a notch. I automatically leaned to the right to stay in an upright position. In the rearview mirror I saw the fear in my face. “Lean outside the window,” Coen ordered. I crawled up my seat and did as he instructed. Luckily there were no trees. I wondered if my fifty kilos could stop a vehicle weighing 3000 kilos from toppling. 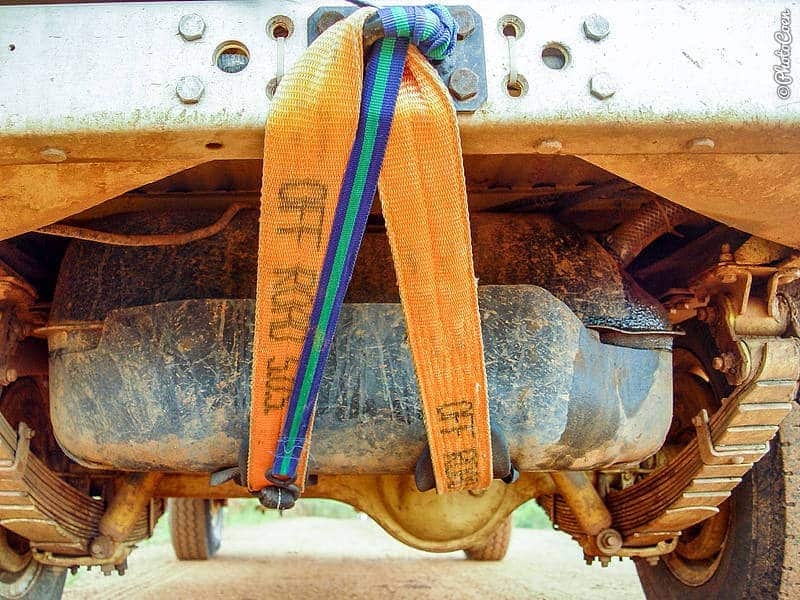 In the past we had learned that those fifty kilos can indeed help to prevent the Land Cruiser from sliding away. On extreme muddy stretches, I will walk alongside the car, holding my hand against the bodywork and thus keeping it on its course. At times every bit does help. Here we were far from a life-threatening situation but obviously we didn’t need a toppled car in the middle of nowhere either. Suddenly the ground leveled out again. “That was close,” Coen concluded. 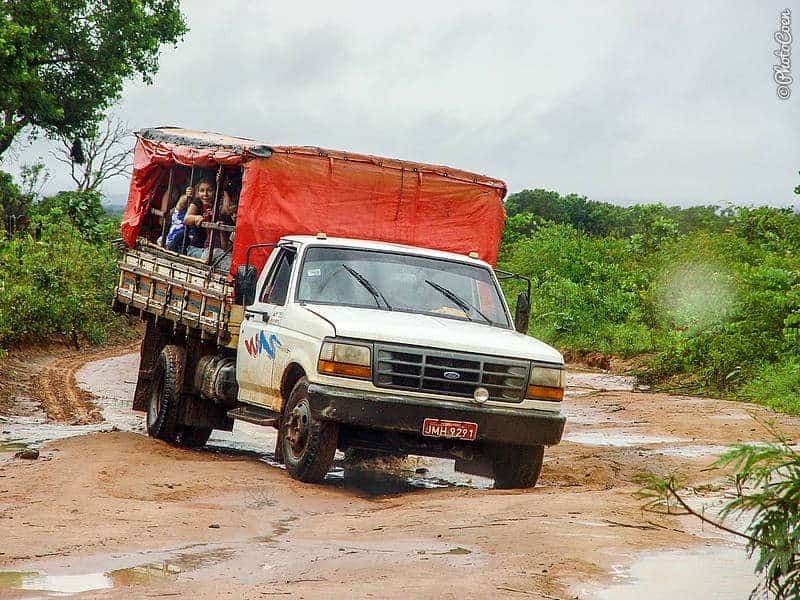 To get to Jalapão State Park, we had to drive south. Neither road map nor GPS indicated any route; however, there was a track. The GPS was our compass and we hoped we would come across a farmer or two to give further directions. Often we wondered if this was the road at all. Entire stretches had been washed away by rainstorms. Other parts had been ripped open and the Land Cruiser had to balance precariously on the high edges where we hoped it wouldn’t slide into the crack. Thank goodness it was dry, and that the four-wheel drive was working well. We were tired and were ready to set up camp. 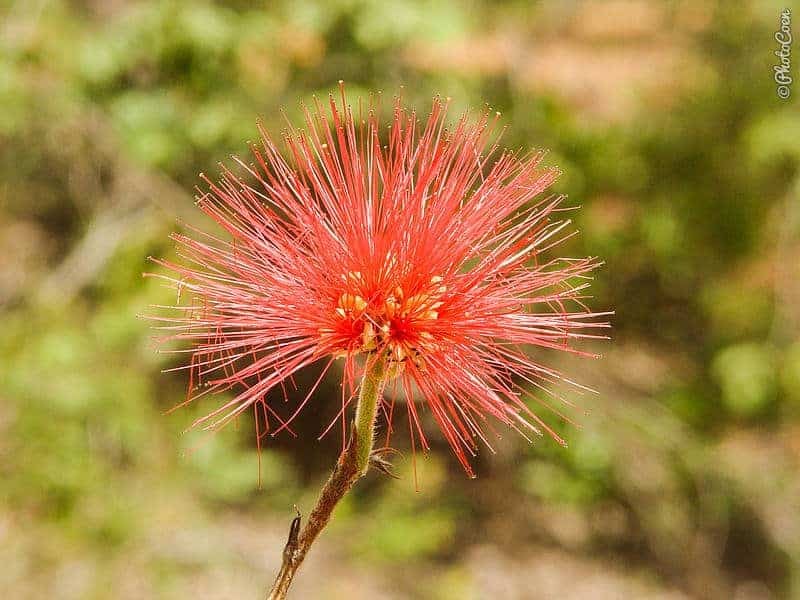 It was a beautiful area of undulating hills, iridescent grass alternating with veradas. But we agreed that we should cover as much as possible of this treacherous stretch now that it was dry. It might well become impassable with the next rainstorm. And so we crawled along. The Land Cruiser fishtailed from left to right on muddy stretches, and on potholed stretches we allowed it to sink ever so slowly into a deep pothole, one wheel at the time. We crossed the Río Caracol. Bit of color every once in a while. Suddenly the mud was gone. We were in dune country. Weird. The Land Cruiser handled the thick sand with aplomb. Coen could let go of the steering wheel, lock the gas pedal and fall asleep if he wanted to (he didn’t, the views were too mindblowing). The rutted track was so deep that the Land Cruiser automatically followed the trail to the other side of the mountain. Dusk was falling. We simultaneously spotted the flat stretch behind tall bushes and trees, invisible from the trail. We had found our spot for the night. We showered under the shower bag, screened the windows with mosquito netting, and crawled into the Land Cruiser before we were to be eaten alive by mutucas (horseflies), pioens (the worst kind of biting bugs), and mosquitoes. Over the past 14 days we had crossed 7 states: Alagoas, Paraíba, Pernambuco, Ceara, Piauí, Maranhão and Tocantins. Not that this said a lot. Some of them we had traversed for no more than 100 kilometers and we couldn’t really say we had seen, let alone ‘experienced’ those states. Still, it was a sharp contrast to our typical average of, say, ‘1 country in 1 year’ kind of traveling. It had been an exhausting but truly exiting journey.